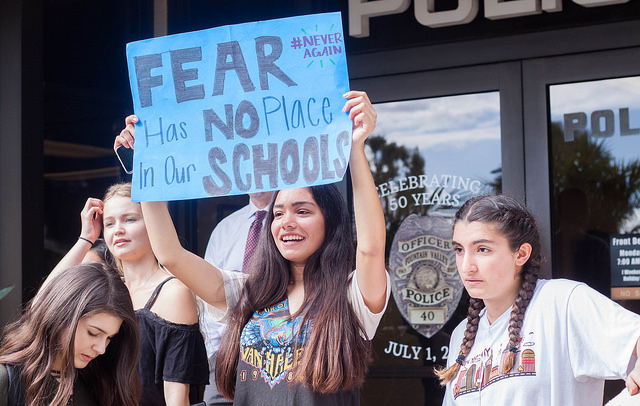 A student from FVHS holds her poster high advocating for the #neveragain movement at the FVPD. Photo by Suzane Jlelati. Students take a moment of silence for the 17 victims of the Marjory Stoneman Douglas High School shooting. Photo by Suzane Jlelati. Juniors from FVHS lead chants “We want change” and hype up the crowd at the bowl. Photo by Suzane Jlelati. Junior Mindy Nguyen initiated the walkout after student representative Cody Do presented his speech. Photo by Suzane Jlelati. At this point, supervision informed students to either return back to school or continue walking. Photo by Aozora Ito. Students crowd in front of city hall as they protest. Photo by Suzane Jlelati. Students march down Slater Avenue towards city hall. Photo by Suzane Jlelati. Principal Morgan Smith makes an announcement to the crowd at the FVPD. Photo by Aozora Ito.